李高峰, 孟贵祥, 张丽婷, 吴建, 严加永, 杨岳清. 新疆东准噶尔拉伊克勒克斑岩铜(钼)矿床成岩成矿年龄、地球化学特征及其意义[J]. 地质通报, 2018, 37(6): 1113-1124. 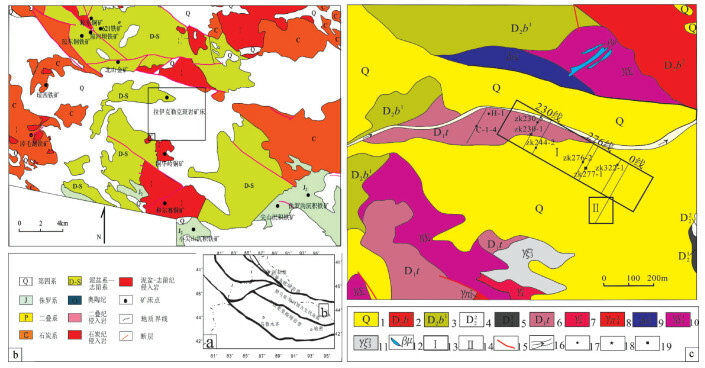 Li G F, Meng G X, Zhang L T, Wu J, Yan J Y, Yang Y Q. Rock-forming and ore-forming ages and geochemistry of the Layikeleke porphyry Cu(Mo) deposit in East Junggar of Xinjiang and their geological significance[J]. Geological Bulletin of China, 2018, 37(6): 1113-1124. Abstract: The Layikeleke deposit is a concealed porphyry deposit newly discovered by comprehensive geoprehensive exploration in Quaternary coverage area. In this paper, U-Pb dating of LA-ICP-MS zircon and dating of Re-Os isotope and Hf isotopes were conducted to investigate the petrology, isotope geochemistry and the age of mineralized tonalities. 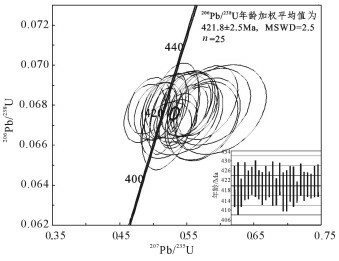 U-Pb dating of LA-ICP-MS zircon was conducted to investigate the age of the sample, which is 421.8±2.5Ma, and the Re-Os weighted mean age for five molybde-nite samples is 409.1±2.6Ma, suggesting that, from the Late Silurian to the Early Devonian, the Layikeleke porphyry copper (molyb-denum) deposit was formed here, similar to things of the porphyry in Qiongheba area. The tonalities are of peraluminous and calc-al-kaline series with high Al2O3, CaO and low K2O/Na2O ratios. The pluton has low total REE content with relative enrichment of LREE and obscure Eu negative anomaly. 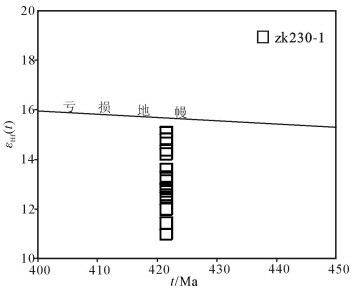 The primitive mantle normalized trace element patterns are characterized by the depletion of the HFSE (Th, Nb, Ta, P, Ti) and enrichment of the LILE (Rb, Ba, U, K, Sr). The testing results of Hf isotope show that tonalitie plutons have high and positive εHf(t) and younger model age, indicating that they were formed in a continental margin arc setting and were related to partial melting of subducted oceanic crust. The results obtained by the authors have important significance for deepen-ing the understanding of magmatic hydrothermal metallogenesis in this area. 李锦轶, 何国琦, 徐新, 等. 新疆北部及邻区地壳构造格架及其形成过程的初步探讨[J]. 地质学报, 2006, 80(1): 148–168. 严加永, 孟贵祥, 杨岳清, 等. 新疆东准噶尔拉伊克勒克岩浆矽卡岩型富铜-铁矿的发现及其成矿特征[J]. 地质论评, 2017, 63(2): 413–426. 吕博, 孟贵祥, 杨岳清, 等. 新疆拉依克勒克隐伏斑岩矿床的发现、ReOs同位素定年及地质意义[J]. 岩石学报, 2014, 30(3): 1168–1178. 董连慧, 徐兴旺, 屈迅, 等. 初论环准嘎尔斑岩铜矿带的地质构造背景与形成机制[J]. 岩石学报, 2009, 25(4): 713–737. 董连慧, 屈迅, 朱志新, 等. 新疆大地构造演化与成矿[J]. 新疆地质, 2010, 28(4): 351–357. 刘兴旺, 郑建京, 杨鑫, 等. 三塘湖盆地及其周缘地区古生代构造演化及原型盆地研究[J]. 天然气地球科学, 2010, 21(6): 947–954. 王登红, 李华芹, 应立娟, 等. 新疆伊吾琼河坝地区铜、金矿成矿时代及其找矿前景[J]. 矿床地质, 2009, 28(4): 73–82. 王晓地, 刘德权, 唐延龄, 等. 伊吾县琼河坝地区斑岩铜矿成矿地质特征及远景评价[J]. 新疆地质, 2006, 24(4): 398–404. 杨富全, 闫升好, 刘国仁, 等. 新疆准噶尔斑岩铜矿地质特征及成矿作用[J]. 矿床地质, 2010, 29(6): 956–971. 李高峰, 孟贵祥, 吴建, 等. 新疆东准新疆东准乌须克劳格岩体LAICP-MS锆石U-Pb年龄、Hf同位素特征[J]. 地质通报, 2016, 35(7): 1170–1183. 王得权, 刘建朝, 张海东, 等. 蒙西花岗斑岩成因与锆石U-Pb年代学研究[J]. 矿物岩石, 2013, 33(3): 63–69. 申萍, 董连慧, 冯京, 等. 新疆斑岩型铜矿分布、时代及成矿特点[J]. 新疆地质, 2010, 28(4): 358–364. 屈迅, 徐兴旺, 梁广林, 等. 蒙西斑岩型铜钼矿地质地球化学特征及其对东准噶尔琼河坝岩浆岛弧构造属性的制约[J]. 岩石学报, 2009, 25(2): 765–776. 梁广林, 徐兴胚, 高长荣, 等. 蒙西斑岩铜矿地质地球物理特征及找矿潜力分析[J]. 新疆地质, 2010, 28(4): 402–408. 程松林, 王世新, 冯京, 等. 新疆和尔赛斑岩型铜矿床地质特征及找矿标志[J]. 新疆地质, 2010, 28(3): 254–259. 杜世俊, 屈迅, 邓刚, 等. 东准噶尔和尔赛斑岩铜矿成岩成矿时代与形成的构造背景[J]. 岩石学报, 2010, 26(10): 2981–2996. 郭丽爽, 张锐, 刘玉琳, 等. 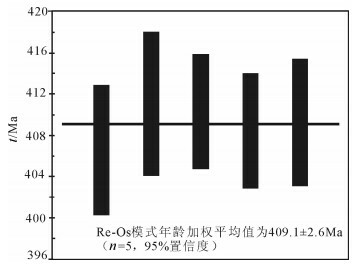 新疆东准嘎尔铜华岭中酸性侵入体锆石U-Pb年代学研究[J]. 北京大学学报(自然科学版)(网络版), 2009, 1: 22–27. 邵陆森, 孟贵祥, 邓震, 等. 新疆拉伊克勒克斑岩铜矿3D电性结构与找矿暗示[J]. 地质与勘探, 2015, 51(3): 953–963. Daly R A. Igneous rocks and the depths of the earth[J]. Mcgraw Hill Comp., New York and London, 1936: 1–598. 黎彤, 袁怀雨, 吴胜昔. 中国花岗岩类和世界花岗岩类平均化学成分的对比研究[J]. 大地构造与成矿学, 1998, 22(3): 29–34. Wiedenbeck M, Allé P, Griffin W L, et al. Three natural zircon standards for U-Th-Pb, Lu-Hf, trace element and REE analyses[J]. Geostandards Newsletter, 1995, 19(1): 1–23. DOI:10.1111/ggr.1995.19.issue-1. Anczkiewicz R, Oberli F, Burg J P, et al. Timing of normal faulting along the indus suture in Pakistan H inalaya and a case of major 231 Pa/235 U initial disequilibrium in zircon[J]. Earth Planet. Sci. Lett., 2001, 191: 101–114. DOI:10.1016/S0012-821X(01)00406-X. Ludwig K R. User's Manual for/EX Version 3:A Geochronological Toolkit for Microsoft Excel Berkeley Geochronology Center[M]. Special Publication: 2003: 41-70. 侯可军, 李延河, 田有荣. LA-MC-ICP-MS锆石微区原位U-Pb定年技术[J]. 矿床地质, 2009, 28(4): 481–492. Stein H J, Cherst en A, Hannah J L, et al. Subgrainschle decoupling Re and 187Os and assessment of laser ablatiom ICP-MS spot dating in molybedenite[J]. Geochim.Cosmochim.Acta, 2003, 67(19): 3673–3686. DOI:10.1016/S0016-7037(03)00269-2. Selby D, Creaser R A. Macroscale NTIMS and microscale LAMCICP-MS Re-Os istopic analysis of molybdenite:Testing spatial restriction for reliable Re-Os age determinations, and implications for the decoupling of Re and Os within molybdenite[J]. Geochim. Cosmochim. Acta, 2004, 68: 3897–3908. DOI:10.1016/j.gca.2004.03.022. 杜安道, 何红蓼, 殷万宁, 等. 辉钼矿的铼-锇同位素地质年龄测定方法研究[J]. 地质学报, 1994, 68(4): 339–347. 杜安道, 赵敦敏, 王淑贤, 等. Carius管溶样和负离子热表面电离质谱准确测定辉钼矿铼-锇同位素地质年龄[J]. 岩矿测试, 2001, 20(4): 247–252. Wieser M E. Atomic weights of the elements 2005(IUPAC Technical Report)[J]. Pure and Applied Chemistry, 2006, 78(11): 2051–2066. DOI:10.1351/pac200678112051. 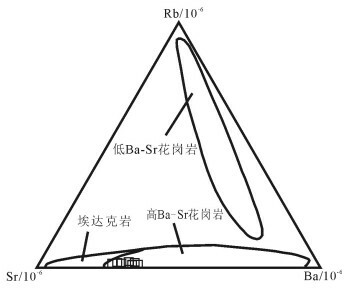 Smoliar M L, Walker R J, Morgan J W. Re-Os ages of group ⅡA, ⅢA, IVA and VIB iron mereorites[J]. Science, 1996, 271(5252): 1099–1102. DOI:10.1126/science.271.5252.1099. 侯可军, 李延河, 邹天人, 等. LA-ICP-MS锆石Hf同位素的分析方法及地质应用[J]. 岩石学报, 2007, 23(10): 2595–2604. DOI:10.3969/j.issn.1000-0569.2007.10.025. 徐平, 吴福元, 谢烈文, 等. U-Pb同位素定年标准错石的Hf同位素[J]. 科学通报, 2004, 49(14): 1403–1410. DOI:10.3321/j.issn:0023-074X.2004.14.012. Blichert-Toft J, Albarède F, Rosing M, et al. The Nd and Hf isotopic evolution of the mantle through the Archean.results from theIsua supracrustals, West Greenland, and from the Birimian terranesof West Africa[J]. Geochimica Et Cosmochimica Acta, 1999, 63(22): 3901–3914. DOI:10.1016/S0016-7037(99)00183-0. Griffin W L, Pearson N J, Belousova E A, et al. The Hf isotope-composition of cratonic mantle:LA-MC-ICPMS analyses of zircon megacrysts in kimberlites[J]. Geochim. Cosmochim. Acta, 2000, 64(1): 133–147. DOI:10.1016/S0016-7037(99)00343-9. Söderlund U, Patchett P J, Vervoort J D, et al. 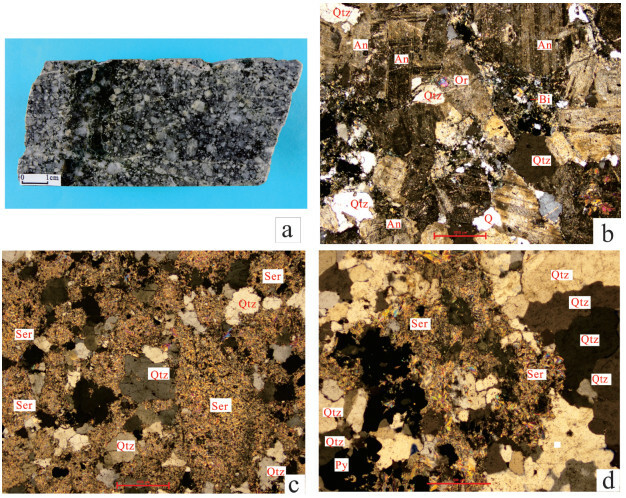 Lu-Hf and Sm-Nd isotopic systematics in chondrites and their constraints on theLuHf properties of the Earth[J]. Earth & Planetary Science Letters, 2004, 222(1): 29–41. Tarney J, Jones C E. Trace element geochemistry of orogenic igneous rocks and crustal growth models[J]. Journal of the Geological-Society, 1994, 151(5): 855–868. DOI:10.1144/gsjgs.151.5.0855. Fowler M B, Henney P J, Greenwood P B. Petrogenesis of high-Ba-Sr granites:the Rogart pluton, Sutherland[J]. Journal of the-Geological Society, 2001, 158(3): 521–534. DOI:10.1144/jgs.158.3.521. 陈斌, 翟明国, 邵济安. 太行山北段中生代岩基的成因和意义:主要和微量元素地球化学证据[J]. 中国科学(D辑), 2002, 32(11): 896–907. 钱青, 钟孙霖, 李通艺, 等. 八达岭基性岩和高Ba-Sr花岗岩地球化学特征及成因探讨:华北和大别-苏鲁造山带中生代岩浆岩的对比[J]. 岩石学报, 2002, 18(3): 275–292. 张旗, 王焰, 王元龙. 燕山期中国东部高原下地壳组成初探:埃达克质岩Sr-Nd同位素制约[J]. 岩石学报, 2001, 17(4): 505–513. 张旗, 王焰, 刘红涛, 等. 中国埃达克岩的时空分布及其形成背景:国内关于埃达克岩的争论[J]. 地学前缘, 2003, 10(4): 385–400. 吴福元, 李献华, 郑永飞, 等. Lu-Hf同位素体系及其岩石学应用[J]. 岩石学报, 2007, 23(2): 185–220. 隋振民, 葛文春, 吴福元, 等. 大兴安岭东北部侏罗纪花岗质岩石的锆石U-Pb年龄、地球化学特征及成因[J]. 岩石学报, 2007, 23(2): 461–480. 张永, 梁广林, 屈迅, 等. 东准嘎尔琼河坝岛弧早古生代岩浆活动的锆石U-Pb年龄和Hf同位素证据[J]. 岩石学报, 2010, 26(8): 2389–2398. ① 孟贵祥, 吕庆田, 严加永, 等. 新疆伊吾县拉伊克勒克一带铁铜矿普查报告. 中国地质科学院. 2016.